Handball’s top men’s small ball and big ball stars thrilled galleries and the thousands on the Las Vegas Strip on Friday at the 2014 WPH/WOR 3 Wallball World Championships. A number of players crossed over, playing in both small ball and big ball, demonstrating that if you can play handball, you can play with any ball! Men’s Pro Small Ball Doubles: *Match of the day Nomination Friday’s action kicked off with a blockbuster doubles showdown featuring three of the top Race 4 Eight stars on the WPH R48 tour and one of the game’s greatest outdoor stars. Sean Lenning and Luis Moreno teamed up and faced Emmett Peixoto and Timbo Gonzalez in the small ball doubles semifinal, with each player displaying the sensational shot making and retrieving ability that makes each of them crowd favorites. Moreno and Lenning built a 10-7 first game lead but relinquished their advantage, as Peixoto caught fire and Gonzalez dominated front court play. Eight consecutive points secured a game one victory for the Californian and the New Yorker. Peixoto and Gonzalez maintained their momentum in game two, building a 6-1 lead and seemingly on the verge of two-game victory. Moreno and Lenning turned up their intensity, fighting back with inspired play. Gonzalez failed to execute a front court kill with his team leading 12-10 that would have put Peixoto and Gonzalez two points from clinching a spot in the final. “I needed to make that shot and that was the turning point in the match,” revealed a disappointed Gonzalez after the match. Lenning and Moreno took advantage of Gonzalez’s mistake and forced a tiebreaker with five consecutive points. The tiebreaker featured the best action of the event, as all four players executed awe-inspiring anticipation and effort. Lenning and Moreno were able to separate themselves and stood just one point from the final at 14-9. The final rally of the match would be the most exciting, as each player contributed to the most exciting action of the event during the 34 shot rally. Lenning ended the remarkable rally with a drive to the left and secured a finals birth for the former 3-Wall national doubles champions. ESPN3 is ESPN’s live multi-screen sports network, a 24/7 destination that delivers thousands of global sports events annually and accessible online via WatchESPN.com, on smartphones and tablets via the WatchESPN app and through ESPN on Xbox LIVE to Gold level members. It is currently available to 92 million homes at no additional cost to fans who receive their high-speed Internet connection or video subscription from an affiliated service provider. The network is also available at no cost to approximately 21 million U.S. college students and U.S.-based military personnel via computers connected to on-campus educational networks and on-base military networks. Launched in April 2011, WatchESPN delivers live access to ESPN, ESPN2, ESPNU, ESPN3, ESPNEWS, ESPN Deportes and ESPN Buzzer Beater/Goal Line on computers, smartphones, tablets, Xbox and Apple TV. It is currently accessible in 55 million households nationwide to fans who receive ESPN’s linear networks as part of their video subscription from Time Warner Cable, Bright House Networks, Verizon FiOS TV, Comcast Xfinity TV, Midcontinent Communications, Cablevision, Cox, Charter, AT&T U-verse or Google Fiber. To watch the exciting Player’s Cup Player’s Championship action live, tune into ESPN3 on Saturday, September 13th and Sunday, September 14th for over 16 hours of live coverage. To watch ESPN3, simply go to http://espn.go.com/watchespn/ or contact your local cable provider. For more information on the event, log onto http://www.r2sports.com/tourney/home.asp?TID=12442. For more information on the World Players of Handball, like us on facebook, log onto wphlive.tv or follow the WPH on twitter @dfwph and @wphlive for all of the handball news from on and off the court! The World Players of Handball is a non-profit foundation aiming to grow the game of handball through innovation and inspiring the next generation of players through junior clinics with certified WPH coaches, junior tournaments, the WPH Outdoor Player’s Cup and the Race 4 Eight tour. Rudy Cruz: A former member of the “Fab Four,” Cruz has maintained his standing amongst the game’s elite with his all-court game. Wins over fellow top eight pro Kevin Gonzalez and top 12 pro Chris Tojin earned Cruz his invitation to the 2014 WPH/WOR 3 Wallball World Championships. Cruz will try to become the fourth ever player to win a Player’s Cup singles title. By Dave Fink, SR Writer- 10 minutes has passed since the last point was played, a controversial call that went against Timbo to end the first game of a highly anticipated WPH Outdoor Player’s Cup quarterfinal against Juan Santos, one of the game’s greatest stars. Timbo eventually reemerges, his impassioned outburst of 10 minutes ago replaced by a more subdued murmur. Timothy Gonzalez does not play handball for recreation. Or as something to do on weekends. Or after work. Handball is his work, his livelihood. He does not play most days. He plays every day, all day and into the night. He plays whoever will play him. Two on one. Left to two. Handicap doubles. He will play you for virtually any odds at any time. In the instance there is no one to play, he practices by himself. For hours. Starting the game of 1-Wall big ball at the age of eight, Timbo quickly became addicted to the sport. He also quickly became one of the game’s greatest 1-Wall players, challenging the game’s top 1-Wall stars Rookie Wright and Gio Vasquez by his mid teens. At 22, he still considers Rookie and Gio to be his biggest 1-Wall rivals. Losing to then 40 year-old Rookie in the 2013 finals of 1-Wall big ball’s most prestigious event, the King of the Courts, looms his greatest disappointment on the handball court, a testament to his respect for his rival. Defeating Rookie and Gio in the semifinals and finals of the 2011 USHA Big Ball 1-Wall Nationals remains his greatest accomplishment on the handball court. Tucson, AZ, Press- “T” also known as Tanisha Groomes was awarded her tenth yellow jersey this past week for fabulous play in the world of outdoor handball. WPH gives a yellow, as a trophy of sorts, to pro winners in the men and the women’s elite circles. “It feels good to reach my 10th jersey,” claims Groomes, our current number one ranked 3 wall big ball women’s points leader. “Nice to have something that shows my number of achievements.” Also receiving their tenth, in the WPH inaugural ceremony, Samzon Hernandez, our current #1 big ball men’s cup leader; Luis Moreno, the indoor small ball 4 wall #1 ranked pro, Tracy Davis, multiple code pro stop champ and last year’s Vegas 3WB Women’s Champ. Each mentioned player will be featured in Las Vegas, September 10th-14th, for the WPH/WOR 3WallBall Outdoor World Championships as titles will be defended and fans will be entertained! Eye ware is mandatory; players will not be allowed to play or practice on these courts without eye protection. No-Tolerance Rule. All event information and updates will be on the WPH main site and the event homepage: www.wphlive.tv/wphoutdoor, http://www.3wallball.com/ and http://www.r2sports.com/. Bring water! Although the event organizers provide ample water, please bring your own. Playing handball in the outdoor dry-desert air is an experience. Please prepare yourself. First Aid tent, refreshments, food and adult beverages will be provided. Tournament goers will get gift bags with free buffet ticket passes, gaming coupons, shirts, and ample souvenirs—The biggest gift bag in our combined sports history, in fact! MAUMEE, Ohio – Everyone’s favorite event of the year, every year! This year marks the 40th Anniversary the event has been held in Toledo. The best three-wall courts and the best hospitality keep it at the top of the list. Bring the whole family! For your time off the court, the Toledo Area has plenty to offer. CLICK HERE to see Toledo Attractions. ROOKIE WRIGHT – Widely considered the greatest big ball 1 wall player of all time. Oh yeah, he also is a former 1 wall small ball national champ too! Rookie defeated current #1, Timbo Gonzalez, in our inaugural 1 Wall year of 2012, 25-21, at the age of 39. LUIS MORENO – He’s won the Pro Doubles with our own Dave Vincent the past two years, is currently ranked #1 on the small ball pro tour and is a past Vegas 3Wall Small Ball World Champion. TIMBO GONZALEZ – Is the best 1 Wall player in the game; currently ranked #1. However, Gonzalez is easily the hottest 3 Wall Big Ball player in the game and with a bullet! You may come to watch Timbo go for a Vegas 1 Wall repeat, but you should stay for his exciting singles and doubles 3 wall play too! SAMZON HERNANDEZ – Currently ranked #1 on the 3 Wall Big Ball Cup Series and is the current cup holder. Samzon is a beast, but we have not seen him in “beast mode” in Vegas since the inaugural year of 2011; getting beat by Juan Santos and Boxer Rosales in previous years. If you have not seen this athlete in person, please come for the show. Amazing….really! TRACY DAVIS – Not a Big Ball Player, traditionally, but she sure looks like it when you sit courtside. She has 10 1 Wall Small Ball National Titles and numerous doubles trophies under her belt and is a returning pro women’s singles (3 Wall Big Ball) champ at these games. TYWAN COOK – He’s our current 1 Wall Big Ball World Champion (Ireland, 2012) and when his left-out-the-door first strike is on, nobody can beat him. Voted the most liked handball player in the game. Come to watch, or just hang out with TY. TANISHA GROOMES – She’s only played handball a couple years and is already carrying more than 10 yellow jerseys. Tanisha is a past winner in the women’s pro big ball 3 wall event, from years past and has won more pro stops than any other women on our tour. EMMETT PEIXOTO – A heartbreaking loss at this event last year (finals of the 3 wall small ball portion) didn’t affect Peixoto’s 4 wall season. 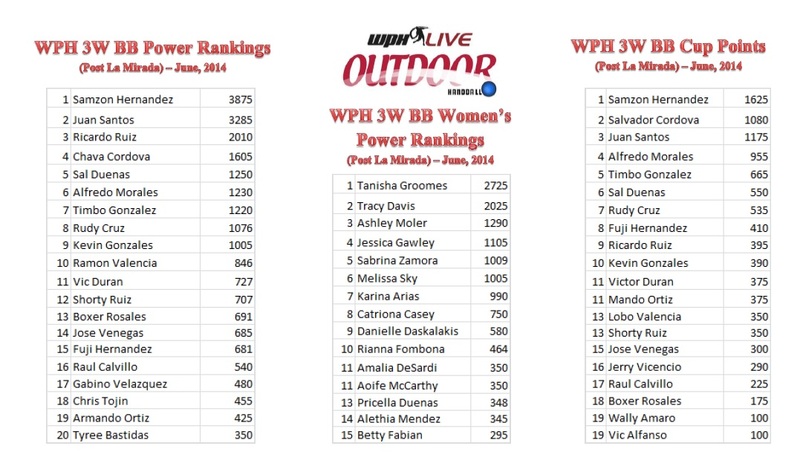 Peixoto worked his way all the up to #2 in the WPH Power Rankings, then made the four wall national finals. A multiple 3 wall national champion, Peixoto knows how to work the angles! Expect a few Yellow Jerseys at this gig! Matches will be streamed like on www.race4eight.com or on ESPN’s WatchESPN App @ www.espn3.com. You can enter or come visit us LIVE; grandstands, food, shade, drink and…well….VEGAS! WPH Outdoor Big Ball 3W Cup Stop #4 – Tijuana Mexico International Tour Stop- WPH Outdoor continued its thrilling Player’s Cup III season with another sensational and dramatic final in Tijuana Mexico’s International Tour Stop. Samzon Hernandez grabbed the first two Player’s Cup stops of the season in Pico Rivera and Las Vegas, while Juan Santos seized Stop #3 in La Mirada, CA. Tijuana’s final would be the first ever Player’s Cup singles title won by a player other than Samzon Hernandez or Juan Santos in the first three seasons of overall play, as Ricky Ruiz faced Mexico’s Victor Martinez in the final. Ricky Ruiz advanced to the final with wins over Victor Escobar, Jerry Vicencio and a walkover against Samzon Hernandez when “The Machine” failed to appear for the 10 am semifinal. Victor Martinez cruised to the final with victories over Daniel Cervantes, Sal Duenas and Chava Cordova. Ruiz faced a formidable task in the final. Martinez played top big ball in L.A. for several years until relocating to Tijuana. Martinez plays daily on the Tijuana’s huge court, and he has acclimated himself to the strategy and angles of the unconventional 3-Wall court. Ruiz learned the game playing all codes of handball, including 4-Wall, 3-Wall, 2-Wall and 1-Wall, playing with all types of balls and rules. Ruiz’s background with all codes of handball undoubtedly helped him to adjust to the 30 foot x 30 feet x 50 foot 2-Wall Tijuana court with a back wall at the 50-foot line. Martinez clinched the first game 15-10, using his control and precision to run Ruiz off the court. “He is really good,” barked Ruiz between games. Ruiz adapted to the big court game in the second game, forcing a tiebreaker, 15-9. “I started using side fronts because those are just killers on that court,” declared Ruiz. “The side front kills force you off the court and force you to do a lot of running.” Ruiz appeared to be tense in the tiebreaker, undoubtedly aware of his opportunity to claim his first ever WPH singles yellow. Martinez raced to an 8-3 lead in the 12-point decider and needed to win just four of the next 13 rallies to claim the title. Ruiz would not relent, and systematically fought his way back into the game. “It was tough and I just gutted it out,” revealed an exhausted Ruiz. “I made a final push and it was just enough to win the title.” Ruiz completed the improbable comeback and his maiden WPH singles yellow in dramatic fashion, 10-15, 15-19, 12-9. “Martinez is no joke,” declared Louie Maciel. “He has crazy control. Ricky had better shot selection.” Victor Martinez and Jose Lopez defeated Samzon Hernandez and Raul Calvillo to win the Men’s A doubles. “Martinez and Lopez just took Samzon and Calvillo to school,” barked Maciel. Thank you to WPH Outdoor, Tom Flores, Andrew Fernandez, Louie Maciel and all of the players and volunteers for making the WPH Outdoor Big Ball 3W Cup Stop #4 – Tijuana Mexico International Tour Stop a huge success. Like the World Players of Handball on facebook, log onto wphlive.tv or follow the WPH on twitter @dfwph and @wphlive for all of the handball news from on and off the court! The World Players of Handball is a non-profit foundation aiming to grow the game of handball through innovation and inspiring the next generation of players through junior clinics with certified WPH coaches, junior tournaments and the Race 4 Eight tour. 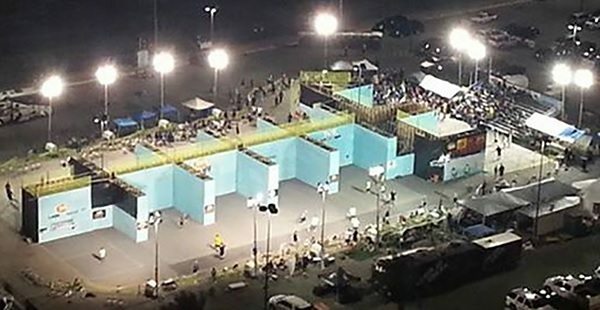 Tijuana, Mexico, WPH Press, 7/22/2014- WPH Outdoor is thrilled to present the 3-Wall Player’s Cup Stop #4 from Tijuana Mexico July 26th and 27th 2014. The Tijuana International Tour Stop represents the final regular season Cup Series event and the final opportunity for big ball pros to earn their invitations to the elite 16-man Player’s Cup Player’s Championship at the WPH/WOR 3WallBall World Championships September 10th-14th, 2014. Top-ranked Cup superstar Samzon Hernandez enters the event on the heels of his first loss of the season at Cup Stop #3 at La Mirada and will be hungry to return to his winning ways. Hernandez will be joined by a group of top challengers, including Sal Duenas, Chava Cordova, Vic Duran and Chris Tojin. Big ball superstars will be faced with completely different court dimensions to what they are normally accustomed. While venues on the Player’s Cup series vary in terms of front wall height, sidewall length and height and back line length, the courts in Tijuana resemble more of a fronton court than a 3-Wall court, with the court being nearly 70 feet long, the front wall being 60 feet high, no left side wall and a back wall at 70 feet. According to “Fab Four” Player’s Cup staple Sal Duenas, the massive court favors either a smart player that can accurately place shots or a player in supreme condition, or both. Duenas believes that the game comes down to strategy and which player can adjust his serves and kills to suit the court’s dimensions. “You can serve the ball 70 feet up in the air to create a giant rainbow lob serve, and something as frustrating as that can be all it takes to win a match,” explained Duenas. “The court can punish aggressive play because trying to end rallies from the 70-foot line leads to setups or errors. Failure to adjust to the big court’s strategy can break players mentally. “ Follow all of the exciting action from Cup Stop #4 in Tijuana by liking the World Players of Handball on facebook, logging onto wphlive.tv or following @dfwph or @wphlive on twitter for all of the updates! The World Players of Handball is a non-profit foundation aiming to grow the game of handball through innovation and inspiring the next generation of players through junior clinics with certified WPH coaches, junior tournaments, the Race 4 Eight tour and the WPH Outdoor Player’s Cup Series. Please consider making a tax-deductible donation today and supporting the growth of the game. 100% of donations go towards junior handball development. WPH Outdoor, Vegas, Press, 6/4/14- 1 Wall Racquetball vs 1 Wall Handball Doubles Exhibition has been scheduled at the World Outdoor 3 Wall Ball Championships (the Stratosphere Hotel & Casino in Las Vegas, NV), September 10-14th. The Hands vs Racquet match will take place during the championship weekend on the show court and the match will be filmed by the WPH film crew, featuring doubles standouts from both outdoor sports: Timothy Gonzalez/Tywan Cook (Handball) Vs Robert Sostre/Freddy Ramirez (Racquetball) (Watch the Timbo Gonzalez interview, HERE) Details will be posted shortly here, www.3wallball.com and on Facebook (after all details are ironed out). Register to play in the Racquetball, Handball Paddle Ball World Outdoor 3WallBall Championships by visiting www.r2sports.com. Info? Email Us, we won’t bite! WPH Outdoor continues the Cup Series with a special 3Wall Big Ball LTE Stop (#2) at the Stratosphere Hotel & Casino in Las Vegas, Nevada, May 30- June 1. This special Shootout will be apart of the WPH Cup Championship Tour (modeled after the Race4Eight Small Ball Pro Tour) and enters it’s third season in 2014. HOTELS: 1-800 998 6937 (reservations by phone only) Stratosphere Vegas/May Room Code: C-BIG14 Reserve before 5/26 to get $39 rooms on Thursday and Sunday night. Fri and Sat night $99. This Vegas Shootout is a .75 (LTE) ranked event, but with good prize money and special discounts on hotel rooms, plus decreased entry fees–All sponsored by 3wallball.com, Ektelon, The Stratosphere Hotel and Casino, plus World Players of Handball-Outdoor. Tucson, AZ, Press- The third season of the WPH-Outdoor 3 Wall Big Ball Player’s Cup continues May 30th-June 1st in Las Vegas, Nevada, at the newly constructed WPH/WOR/3WallBall Outdoor permanent courts at the Stratosphere Hotel & Casino (off Las Vegas Blvd @ the Employee Entrance on Pennsylvania Street). The Vegas stop will be the second, in as many months, with the third stop set for La Mirada, California, June 27th-29th, as the Junior WPH Big Ball 3 Wall Nationwide Challenge and Cup Stop #3 will set sail. You can gather more information regarding stop #2 in Vegas/May, or enter on line, HERE> Email us for complete details: wph@race4eight.com. The Scoop: WPH-Outdoor’s Cup series will tally points at each stop (similar to the WPH R48Pro Small Ball Tour); then invite the top 16 pros at the season finale September 10-14th at the 12-court Vegas 3WallBall Outdoor World Championships (info also at www.3wallball.com … or HERE>). “You can only get into the September Vegas pro division by having the most Cup points,” says WPH Outdoor Director, Dave Vincent. “This year, only 16 players will be allowed in the pro division at the season finale. Getting to these stops and scoring points is necessary!” The WPH will allow the top 16 players in the season finale big ball 3W “Pro” division and select additional players randomly, if players decline the invite. All other divisions are open. Stop #1, held at Pico Rivera Park in April, featured nearly 140 players, to include 2013 Cup Champion and eventual winner, Samzon Hernandez. Manny Sanchez teamed up with the Hawthorne kid (Hernandez) to take the pro doubles; meanwhile, Tanisha Groomes defeated 2013 Vegas 3WallBall winner, Tracy Davis, in the pro women’s final. Results featured HERE at r2sports.com. Stop #2 will be held at the Newly Constructed world championship practice courts on the north side of the Stratosphere Hotel and Casino, May 30th-June 1st, in conjunction with Ektelon, 3wallball.com, Ahern Construction and WPH-Outdoor, hosted by the Stratosphere. “We are lucky,” says Tom Flores, WPH Co-Director. “The Stratosphere Hotel and Casino has stepped up to give us cool room rates and the WPH has decreased entry fees and will create a very fun environment to close out the month of May. All I can say is get your beauty sleep now!” Online Entry form, HERE at r2sports.com. Stop #3 will bring the WPH Outdoor 3 Wall Nationwide Handball Challenge & Pro Cup Stop, all presented by Junior WPH, June 27th-29th, at La Mirada Park in sunny California. This is an official Junior National Championship featuring youth players and pros on the court together with clinics and training sessions, plus competitive action. “Last year we had over 150 juniors enter,” barked WPH Junior Director, David Fink. “This year we will have a very clean family friendly park with a bunch of fun things to do for all.” La Mirada is 15 minutes from Disneyland and Coastal Beaches. “We have made this one VERY affordable too,” beams Fink. “The junior entry fee is $10 bucks or less, in most cases.” WPH will refund (at the tourney desk) $5.00 back to anyone who brings a junior (no limit) and enters them into the event in advance. Online entries can be made HERE at r2sports.com. All cup stops need to be pre-registered at r2sports.com. No walk up entries. Stop #4 will be at a to-be-determined location (finalizing permits) and #5 (Season Finale) will be held at the Vegas 3WallBall Outdoor World Championships September 10-14th, at the Stratosphere Hotel and Casino. The biggest combined (Racquetball, Paddle Ball and Handball) event in the world, is the first of its kind and features multiple forms of handball; to include 1 Wall big ball/small ball, 3 Wall big ball/small ball, to name just a few. Past participants include Racquetball’s Marty Hogan, Cliff Swain, Rocky Carson, Rhonda Rajsich, and Paola Longoria, to name just a few, plus Handball’s Dave Chapman, Luis Moreno, Sean Lenning, Naty Alvarado, John Bike, Tyree Bastidas, Emmett Peixoto, Nik Nahorniak, Timbo Gonzales, Pee Wee Castro, Willie Polanco, Rookie Wright, Geo Vasquez, Tracy Davis, Samzon Hernandez, Juan Santos, Boxer Rosales and more! Online entries for the World 3WallBall Championships in September can be found HERE at r2sports.com. Get more information at www.wphlive.tv/wphoutdoor or r2sports.com. You can get clarification on rules, code of conduct and specifics by emailing: wph@race4eight.com. See you at the courts! 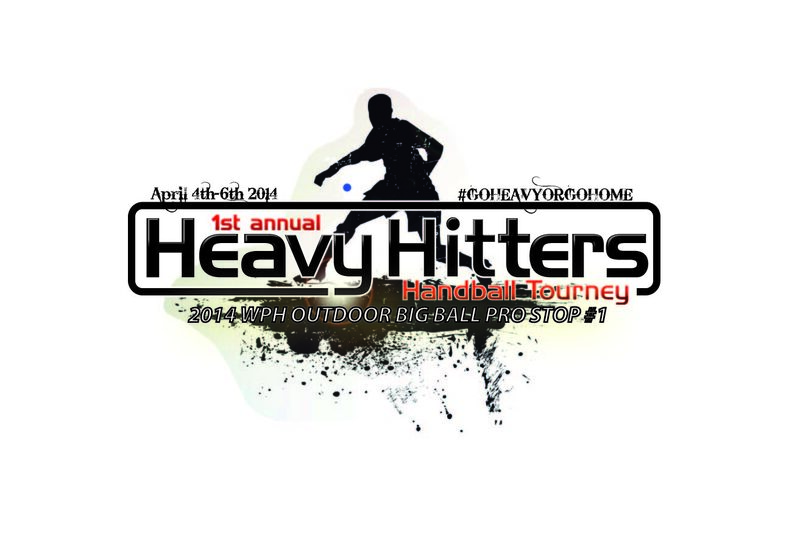 The 2014 Heavy Hitters 3Wall Handball Ball WPH Pro Stop #1 presented by EDTL is took place April 4th-6th at Pico Rivera, CA, and what a blast it was. Tanisha Groomes defeated Tracy Davis to win the women’s pro division; meanwhile, Samzon Hernandez took down Alfredo Morales in the men’s final minutes before slamming the event with doubles partner Manny Fernandez. The 2013 WPH/WOR 3WallBall Outdoor Handball/Racquetball/Paddleball Championships nearly crowned the wind as the champion, as 50 mile per hour gusts nearly destroyed the court complex at the Stratosphere. Play was suspended for over an hour, but when play resumed, fans were treated to incredible men’s and women’s big ball action. Juan Santos upset (newly crowned and previously undefeated) 2013 Player’s Cup Champion, Samzon Hernandez, in a lopsided men’s big ball final to defend his 3WallBall title. Santos was impervious to the wind, trouncing a lethargic Hernandez 15-6, 15-12 in just 25 minutes. “It feels really great to win,” revealed Santos. “I have been training really hard. Samzon is such a great competitor, and I am so happy to have won.” Despite losing in the final, Samzon Hernandez captured the prestigious WPH Player’s Cup with wins in three of the four WPH Player’s Cup events and a finals appearance in the fourth. Read more HERE>The World Players of Handball, in conjunction with World Outdoor Racquetball, 3WallBall.com and Ektelon, is thrilled to present the 4th annual World Outdoor 3Wall Ball Championships. Over 600 of the best outdoor players from all codes, from across the United States and the world will be competing in the shadow of the beautiful Stratosphere Tower Hotel and Casino on the Las Vegas Strip. The World Players of Handball-Outdoor is thrilled team up with Junior WPH to announce the 2013 WPH 3-Wall Big Ball Junior Nationals August 17th-18th, with Pro Shootout (beginning Aug 16th). Over 100 kids between the ages of 11-20 are expected to compete at Marina Park in Surf City, CA, and you are invited! “The WPH is highlighting the juniors at the 3-Wall Big Ball Nationals,” claimed WPH Youth Donor and Development Director David Fink. “The pros will be on hand to not only inspire the juniors with their exceptional play, but also to teach clinics, referee, and lead by example. The goal of the World Players of Handball has always been to highlight the elite players in the game to inspire the next generation of players, and that is exactly what we are going to do at the WPH 3-Wall Big Ball Junior Nationals.” The elite pros and qualifiers will compete in a Unique-to-Big Ball format (similar to the R48Pro small ball structure; Elite Eight Named; Eight Qualifiers; 16-Man only; One game matches; etc). Samzon Hernandez, Juan Santos, Rudy Cruz, Sal Duenas, Gabino Velazquez, Boxer Rosales, Raul Calvillo, and Ricky Ruiz have accepted their invitations as the “Elite 8,” and eight qualifiers will fill out the 16-man elite field. “We will qualify eight players on Friday, August 16th, after 4pm,” says WPH Executive Director. “We will have four brackets of four qualifiers [16-max in the qualifier]. Each qualifier winner will be placed into the #5-#8 spots with a blind draw. Each qualifier loser will be blindly-placed into #1-#4 spots. We will have the best players in the game and we can’t be more excited.” At the time of this release, WPH-Outdoor reports 20 of the top 25 players in the big ball game have entered. Junior WPH, along with WPH-Outdoor and local directors will be seeking east and west coast juniors. The event will also aim to introduce juniors to the game for the first time. For assistance or more info, please contact the WPH @ wph@race4eight.com. “We introduce the game of handball to juniors with a big ball,” stated WPH Executive Director David Vincent and co-tournament director. “It’s most fitting that we now turn the corner and give them a chance to compete in a fun and friendly atmosphere.” “I pay more attention to the juniors then the pros”, revealed junior handball advocate, Luis Gayton. “That is my goal, make sure they enjoy the competition. I run many juniors tournaments, all of them with double elimination, and I’m very happy about it all the way.” The double elimination format ensures that each of the juniors will play at least two singles matches. The juniors will also play doubles, so each junior is guaranteed at least four matches throughout the weekend. All of the players and families will enjoy a weekend of handball, fun, and great camaraderie at one of the most beautiful 3-Wall facilities in the country. “Marina Park is a top-notch location for this kind of event,” stated Sal Duenas. “All the courts are perfect. There is plenty of viewing, and the park safe and friendly for kids and families. This is one of the premier parks in Orange County with everything you need.” Juniors will be awarded medals and plaques, but mostly will have the opportunity of a lifetime to learn from the elite of the game in one-one-one lessons. “Just as we have asked of our Race 4 Eight players, the elite big ball stars will be asked to not only be great handball players, but great roles models for kids to emulate” claimed Junior WPH Director, David Fink. “Winning and losing is secondary to sportsmanship, integrity, and being a positive member of the handball community.” Entry fees for this event have been priced to encourage juniors to participate, with each player receiving a souvenir, constant food and drink, prizes, trophies, pro player attention, skill competitions and multiple matches. Please consider making a donation to Junior WPH to help off-set costs occurred. Contact the WPH for assistance, grant details and more: wph@race4eight.com. For all of the information and entry form to this incredible event, log onto: http://www.r2sports.com/tourney/home.asp?TID=11370. The WPH/Ektelon 3-Wall Big Ball Nationals- June 1st & 2nd, 2013 (Story Posted June 3rd) The first ever WPH 3-Wall Big Ball Nationals in Venice Beach produced the most electrifying atmosphere in outdoor handball history. Hundreds of competitors and thousands of fans gathered on the sun-splashed beach in Venice to crown men’s, women’s, and junior national big ball champions. The men’s and women’s pros dazzled enthusiastic galleries throughout the weekend extravaganza, and the 38 junior players under the age of 20 inspired and captivated the entire beach. In just the first year of the WPH 3-Wall Big Ball Nationals, nearly 500 players competed from both coasts in a celebration of the fastest growing version of handball. Men’s Pro Singles Samzon Hernandez entered the event as the number two seed, but most observers considered him to be the favorite. “The man is always motivated, intense, and strong,” claimed big ball national quarterfinalist Ricky Ruiz. “Someone would have to be on top of his game to beat him.” Two of the “Fab Four” were eliminated before the quarterfinals, demonstrating the incredibly deep talent pool in big ball handball. “There are 16 guys that can easily advance to the semifinals or beyond in these events,” claimed WPH Outdoor Head Referee David Fink. “Every match is so close, and the difference between losing in the first round and advancing to the final is often one shot in a match.” Top seed Juan Santos and number two seed Samzon Hernandez were both pushed to tiebreakers in the round of 16. “I was definitely worried,” claimed Hernandez when referring to the 7-1 tiebreaker deficit he faced in the round of 16. “I just tried to keep the pressure on and he (Chava) seemed to get nervous.” Samzon Hernandez cruised to the final after his round of 16 scare, easily defeating former doubles partner Ricky Ruiz in the quarterfinals and “Feo” Venegas in the semifinals. Juan Santos also cruised in straight sets in the quarterfinals and semifinals to reach the finals, defeating Raul Calvillo and rising star Alfredo Morales respectively. In a rematch of the finals of the Simple Green U.S. Open, Samzon and Santos battled once again for big ball supremacy. Santos plays his best handball on the long courts of Venice, but Samzon applied too much pressure to his rival, dismantling Santos 15-11, 15-4 to clinch the first ever 3-Wall Big Ball National Title. “Samzon appears to be more motivated for each event,” claimed David Fink. “The more he wins, the more he burns to win again.” “I want to say thank you to WPH, staff, players, and spectators for making the Big Ball 3-Wall Nationals a big success,” claimed newly crowned 3-Wall Big Ball National Champion and living legend Samzon Hernandez. “It was a fun weekend. And for all the people that were against me thank you for giving me that extra boost. Can’t wait for the next event coming with that fire.” Men’s Pro Doubles The men’s pro doubles has historically been the most exciting division in big ball. Rallies often feature multiple dives, 50-plus shot rallies, dramatic momentum changes, and unrivaled passion from the massive crowds cheering on their favorite teams. Alfredo Morales announced himself on the national stage with a stunning upset over Shorty Ruiz in the singles. Although he would eventually lose to Juan Santos in the singles, he would redeem himself in the doubles. Morales and “G-Man” Velasquez survived close tiebreaker wins in all three of their matches en route to the final, as did their final’s opponents Juan Santos and Lobo. In perhaps the most exciting match of the championships, both teams thrilled crowds with amazing diving gets, diving rekills, and nonstop action. Morales and “G-Man” were cool under pressure and ultimately clinched the tiebreaker with a sensational victory. “I have never played in a pro finals match so to play in one was amazing,” claimed newly minted 19-year-old 3-Wall big ball superstar and national doubles champion Alfredo Morales. “Surprisingly, I didn’t feel an ounce of nervousness. I just went out there and had fun and did the best that I could, and luckily it paid off. The energy from the crowd was unbelievable. Whether they were cheering me on or the opposite for me it was such a great experience for me. The pro doubles win meant everything to me. I had trained non-stop the past weeks. Honestly, the yellow jersey meant everything to me. That jersey to me is worth more than money knowing that I trained hard for it. Money comes and goes but that yellow jersey is forever.” “The doubles final was the last match of the tournament and the crowd was huge,” claimed big ball player and enthusiast Derek Pyper. “Referee Shorty Ruiz constantly had to get people to back up and give the players room because everyone wanted to see the action. I can’t possibly describe what it was like watching this match and the rest of the games throughout the weekend. There were rallies in this match that had to be 90 seconds long, it was truly unbelievable, the athleticism on display through the match.” Women’s Pro Fourteen of the best women’s 3-Wall big ball superstars ascended on Venice Beach to battle for the title of best female in the sport. In the Women’s Singles, Tanisha Groomes entered the event as the number one seed, having never lost a match in WPH competition. Groomes would face a serious challenge in her semifinal against all-court superstar Danielle Daskalakis. Trailing 11-14 in game one, Groomes appeared to be on the verge of falling one game behind for the first time in WPH history. Groomes won four straight rallies to steal the momentum and the game and cruised in game two to clinch her spot in the final. Ashley Moler entered the event as the number two seed, and easily defeated New York 1-Wall specialist Melissa Sky to clinch her spot in the final. Groomes was too strong for Moler in the final, overwhelming the WPH Outdoor Director with precise kills and powerful drives. Groomes captured her fourth WPH women’s title in four events. “Tanisha continued her dominant reign in the women’s singles,” claimed Ashley Moler. “She’s the best and has proved it over and over again.” Groomes partnered with Lilly Prez to complete the Women’s Slam. Groomes and Perez defeated the New York powerhouse team of Daskslakis and Ng in the semifinals, and defeated the east coast/Midwest tandem of Alethia Mendez and Amalia DeSardi in the final. Juniors “We consider Sunday “Kid’s Day” at our big ball events,” claimed WPH Youth and Development Director David Fink. “Sunday is when we have the top players teach clinics to inspire the kids, as well as organizing junior tournaments to allow the kids to enjoy the thrill and camaraderie of playing in tournaments. This event was certainly one of best we have ever had for the juniors.” The WPH’s commitment to developing the game was evident on Sunday. The juniors took over the courts by midday on Sunday, and most of the enormous galleries shifted to the junior courts to watch the junior clinic hosted by WPH Youth and Donor Director David Fink and 3-Wall superstar Samzon Hernandez and the junior tournament. “Helping with the clinic was a huge thrill for me,” claimed Samzon Hernandez. “The first shot I taught the kids was a side-front kill, and I used that shot a lot in my match with Santos later in the day. Every time I used the shot effectively, I was thinking about the clinic!” The 11-and-under featured some of the most promising talent in recent memory. Gabriel Crespio advanced to the final with two impressive wins and faced Eddie Rocha in the final. Crespo emerged victorious in a thrilling match, and became the first junior crowned in Venice Beach. “There were people strolling through the beach that had never seen handball before that stopped to watched these two kids that were no more than four feet tall and 80 pounds hitting the handball from the deep court with both hands,” claimed WPH 3-Wall Big Ball Junior Nationals tournament director David Fink. “I had a basketball coach stop me and ask me if I could teach his group handball because he was so impressed with the athleticism and sportsmanship of the Gabriel Crespio and Eddie Rocha. It looks like we will add about 20 new players at Venice Beach between the ages of 6-13 in the coming months. Exciting times for junior handball!” The 15-and-under featured a full round of 16. Chris Camilo faced Gabriel Carbajal in the final. Both youngsters won three rounds en route to the finals. In one of the most exciting matches of the day, Chris Camilo edged Gabriel Carbajal by the slimmest of margins to clinch the title. The 19-and-under division was mistaken for the open by a number of fans. “I play with some of these guys, and these guys are amazing!” remarked top pro Shorty Ruiz. “I tried to enter the pro doubles with Christian Lopez, but I already had a partner.” Chris Vargas dominated the top half of the draw, and Christian Lopez cruised in the bottom half of the draw to setup of final between two youngsters that will be competing on the elite level in the near future. Lopez’s experience was the difference and he edged past Vargas to win the title. Men’s A’s Erik Gonzalez and Vic Villanueva staged an epic A singles final for the right to call themselves pro players. Villanueva held a match point at 14-14 in the second game after winning the fist game 15-12, but appeared to run out of energy just before he could cross the finish line. Gonzalez won a 17-shot rally to clinch the second game, then held of a late Villa charge to win the title in the third game. “It’s always 50-50 when we play,” claimed Villanueva. “I almost had him today, but I was just happy to be a part of such a great event.” Brian Fombona and Noe Garcia won the Men’s A Doubles over Danny Delacruz and Erik Gonzalez and denied Gonzalez the “A” slam. The second season of the WPH Big Ball Cup Series started with a surge of excitement. “The tournament was like something I’ve never experienced before,” claimed one of big ball’s elite players and supporters Sal Duenas. “It was like the Olympics of handball at the beach. Every matchup was perfectly set, organization was second to none, and the amount of fans, players, spectators, women participants, and juniors was something I have never before experienced or seen before, and this was just the beginning!” “The venue, the crowd, the beach, the weather, and the games all made for the perfect ending to a perfect tournament run smoothly and effectively by Ashley Moler,” revealed Derek Pyper. “Thanks WPH for hosting this event and bringing 3-Wall Handball, the most exciting sport there is, to the public.” The WPH will continue to build on the momentum from the WPH 3-Wall Big Ball Nationals with upcoming stops in northern California, southern California, and Las Vegas. The big ball players have all been challenged,” claimed WPH Executive Director and Outdoor Handball Architect David Vincent. “There are athletes all around the country at parks dreaming of being on a grand stage. The WPH is in search of these elite players as we construct the Player’s Cup Series exposing the game’s best from coast to coast. As a result, more players are venturing out of their city, more players are beginning to play this sport, more families are becoming involved, and more attention in the media has been placed on the players and the game. We, as an organization, cannot be more excited for the future of handball.” For the full results of the tournament go to http://www.r2sports.com/tourney/home.asp?TID=10884. The WPH will hold Player’s Cup #2 July 27-28 in Tracy, CA (northern California), Player’s Cup Stop #3 September 19-22 at the Stratosphere in Las Vegas. Make your plans now!